SQL Server supports the following types of constraints: NOT NULL, CHECK, UNIQUE, PRIMARY KEY and FOREIGN KEY. Using constraints is preferred to using DML Triggers, rules, and defaults. The query optimizer will also use constraint definitions to build high-performance query execution plans. Only 25% of the people will tell you to use something that you can use from within SQL, and only 10% will actually know that this something is called a check constraint, the other ones know that there is something where you can specify some values to be used. Why do we need constraints at all? 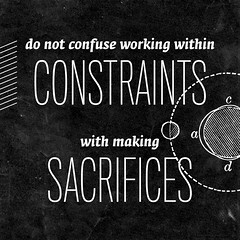 So why do we need constraints? To answer that question, first you have to answer another question: how important is it that the data in your database is correct? I would say that that is most important, after all you can have all the data in the world but if it is wrong it is useless or it might even ending up costing you money. To make sure that you don’t get invalid data, you use constraints. Constraints work at the database level, it doesn’t matter if you do the data checking from the app or web front-end, there could be someone modifying the data from SSMS. If you are importing files, constraints will prevent invalid data from making it into the tables. The reason that check constraints are preferable over triggers is that they are not as expensive as triggers, you also don’t need an update and an insert trigger, one constraint is enough to handle both updates and inserts. This is a common complaint, when you script out the databases and the primary and foreign key tables are not in the correct order you will get errors. Luckily the tools these days are much better than they were 10 years ago. If you do it by hand just make sure that it is all in the correct order. Another complaint is that constraints are wasting developers time, they can’t just populate the tables at random but have to go in the correct order as well.